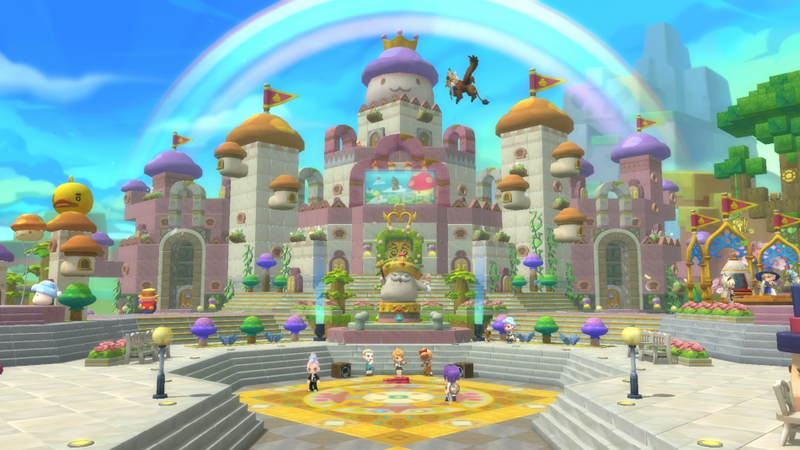 We're still working on getting MapleStory 2 ready for its official launch in October, but to tide you over until the full game is ready to go, we're releasing Mushking Royale for a special Pre-Season event! 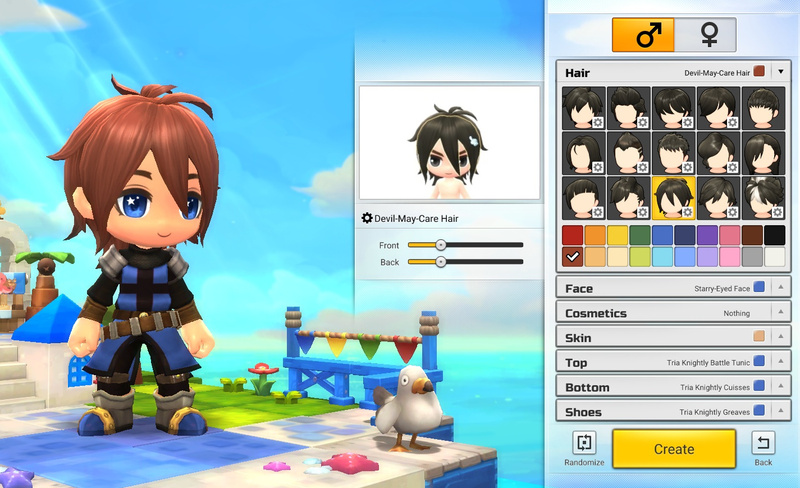 Creating your first MapleStory 2 Character and Reserving your Name! With the launch of Mushking Royale Pre-Season, anyone will be able to login and create a character that will be carried into MapleStory 2's official release! Claim your favorite name, pick which class you'll start out with, and get them looking just the way you want. Then hop into Mushking Royale where you'll be able to earn dozens of rewards that you can use during Mushking Royale Pre-Season, Head Start and beyond! After a brief tutorial on MapleStory 2's controls, you'll be sent to Royale Park, where you can chat with other players, experiment with some of the weapons you'll find during Mushking Royale and queue up for a match whenever you're ready! 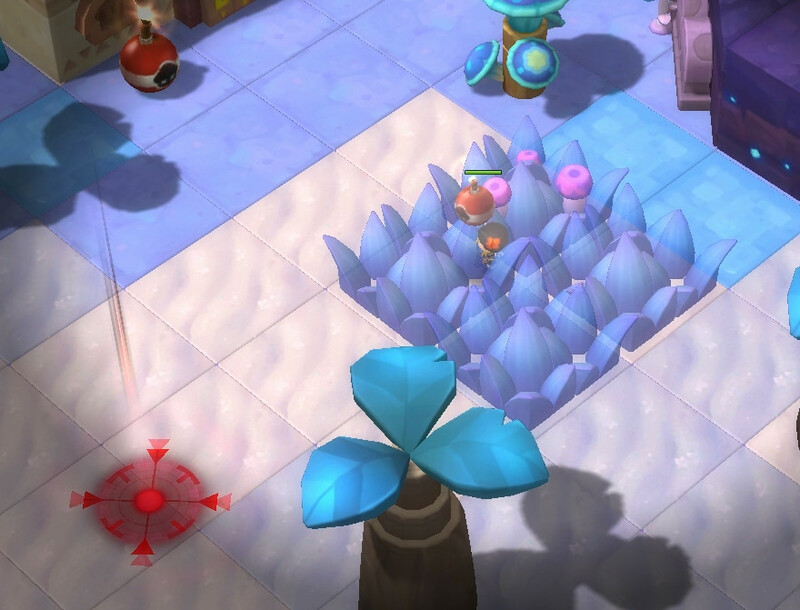 Collect Mushroom Coins by playing Mushking Royale, which can be exchanged for special cosmetic and vanity items in Royale Park, with any prizes you earn remaining available after MapleStory 2's launch. We'll also be holding special events throughout the Pre-Season, so be sure to keep an eye on the MapleStory 2 website and social media page to stay up to date on the fun! And if you want in on the Head Start beginning October 1st, or or just need some goodies to get your MapleStory 2 adventures off the ground, play during the Pre-Season and take aim at claiming one of hundreds of Founder's Packs we're giving away! The top players in each region and for each game mode will receive a Founder's Pack rewarding their results in this special game mode, including Legendary Packages for the top 10 players in each region! In addition, the top players for Solo and Squad mode in each region will earn a 30-Day Sleepy Shroom Nap Emote! There's also a pair of titles up for grabs, with the top 40% of Solo players earning the Royale Commando Title and the top 40% of Squad players earning the Squad Ace Title! Players can only win one Founder's Pack on the account that was placed in the rankings. If a player was placed in the rankings of more than one region, the highest valued Founder's Pack that was won will be granted. If you win a Founder's Pack of higher value than your current Founder's Pack, your Founder's Pack will be upgraded to the higher value pack. If you win a Founder's Pack of equal or lesser value than your current Founder's Pack, the prize value of the new Founder's Pack will be given in Blue Merets instead. The Royale Pass is your ticket to special items you can earn by playing Mushking Royale! As you rank up in Mushking Royale, you'll gain access to special items, including outfits, special Chat Bubbles, Tombstone badges and more. 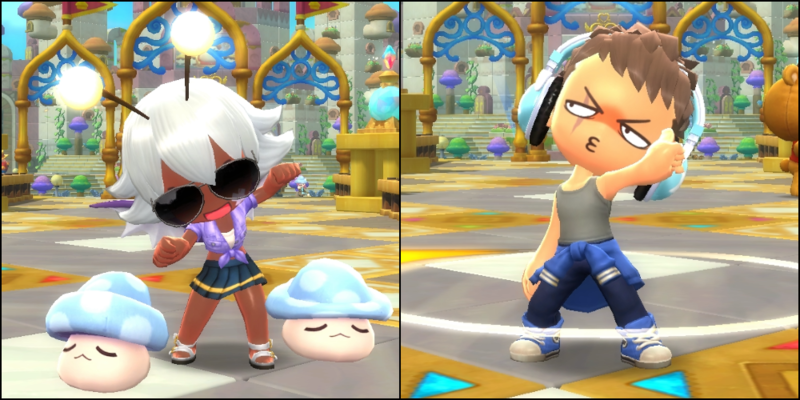 You'll get many of these items for free with the Silver Royale Pass, but you'll need the Gold Royale Pass to get access to the full set, which includes Royale Experience Boosts, special outfits and more, and everything will remain on your character for when MapleStory 2 officially launches! We've made a number of changes to Mushking Royale since its introduction during Closed Beta 2. We hope these changes will make it even more fun to play, so check out the patch notes below! A Select Mode screen has been added, allowing you to select between MapleStory 2 and Mushking Royale. Currently, only Mushking Royale is available to play. Merets are now purchasable with NX. 1 Meret is worth 10 NX, and can be purchased in 100, 500, 2,500, 5,000 and 10,000 Meret packages. While the MapleStory 2 cash shop is not yet active, you can spend Merets on the Royale Pass, or by purchasing other players' items via the Design Shop. You can also put your own creations up for sale to other players through the My Shop menu, earning you 70% of the sale price! A special Mushking Royale tutorial has been added, to introduce you to some of the game mode's special features. Royale Park has been added, including a number of features to help you practice your Mushking skills. Throw bombs in the training area, located to the west of Royale Park, and target Sleepy Shrooms and Golden Slimes to practice your aim. Pick up skills from the chests scattered around Royale Park to practice with the abilities. There are vendors throughout Royale Park that will exchange Mushroom Coins, that you can earn via Mushking Royale or Royale Pass, for a variety of fun cosmetic items, consumable items and coupons that can be used at the Beauty Salon, Plastic Surgery Office and Dye Workshop in Royale Park! There are also trophies to earn, NPCs to chat with and secrets to discover! Squad Mode has been added, to let you team-up with your friends in Mushking Royale! Join Squad Mode with a party of up to 4 players, and you'll enter Mushking Royale with them backing you up! Squad members do not take friendly fire from attacks and will display on your minimap and when hidden. Use the Party Pep emote to remove debuffs from members of your Squad. When you die in Squad Mode, a destructible Tombstone will land on your position, which will revive you if your party members can manage to destroy it. If they fail to damage it for 10 seconds, a Metal Tombstone will fall to finish you off. If you have no other party members alive, the Metal Tombstone will fall immediately. If you join Squad Mode alone, you will be matched with other players to form a 4 person squad. The following skills cannot be found in Squad Mode: Throwing Star, Whirlwind, Stun Bomb, Corn Dogs, Dash Attack. Random Mushking Royale Event: Toady's Prank! Periodically during a Mushking Royale match, five Toadies will spawn in and announce their presence to everyone left in the match. Take down Toadies to claim a wealth of skills and items! Be warned though, a Toady will announce to the entire map when it's attacked or killed. Movement and Jump Speed increased by 200%. Other players' locations will appear on your mini-map. Skill cooldowns decreased by 50%. All Boxes, Sleepy Shrooms and Golden Shrooms disappear from the map, leaving no way to get more items. Multiple MK52 Alpha robots will spawn in across the map. Blockade: Spawns a large blockade in front of you, which will block movement. Can be destroyed by attacks, and will disappear after a time. Use it for cover to take the edge in a brawl, or when retreating to prevent them from following! Sanctuary Flare (Squad Mode only): Heals nearby party members by 150 Health. 30 second cooldown. Mushking Royale Medals have been added! A number of UI menus are still shown, but can only be accessed in the main MapleStory 2 experience. Chroma keyboard lighting support has been added. Mushrooms and Chests will drop a wide variety of items when dealt with. Some of these items include useful consumables, like healing herbs, damage boost, even trackers that can tell you where other players are on the minimap, but they also include special abilities to really give opponents a hot foot. These powers are far, far stronger than your normal attacks, so you'll need to stock up and aim well, because each power can only be activated once per pick-up. Keep an eye on those powers and try not to get into a fight if you don't think you can finish it. You can also augment your arsenal with throwable bombs, which can be found throughout the map. Some set the ground aflame, dealing damage to anyone that ventures inside. Other bombs boost the damage taken by those splashed with the odd liquid. There are also magnets, spike balls and a runaway cart that you can pick up and send careening at the enemy. Only one bomb can be picked up at a time, and you won't be able to do some actions while holding it. But any weapon is a good weapon when you're down to your last rocket and you see a giant robot charging at you. Mushtopia contains a large number of environmental details to keep you on your toes. The tall grass is one of the more generous details, if you're in it. It completely hides you from anyone outside your patch of grass, letting you get the drop on your foes... as long as they don't throw a bomb into the grass, just to be sure. The thorny grass isn't so benevolent, however. You can try to run through it if you're desperate for escape, but those thorns can easily finish you off if you're not healthy enough. There's also toxic sludge and other environmental hazards you'll need to avoid if you want to be the last Mapler standing. The Towers scattered around Mushtopia might be one of the more insidious threats, however. They won't hurt you themselves, and Golden Chests featuring a better selection of items can often be found at their base... but if you step foot in them, the alarm will sound, and every other player's minimap will light up. There's countless other tricks and features with Mushking Royale that you'll need to know to beat the opposition, and we look forward to seeing your strategies and your epic victories as Mushking Royale Pre-Season rolls on!